Earlier this week, I made roasted potatoes for my family. This is a recipe that I do over and over again because it is naturally gluten-free and super easy to make. By definition, I guess you could say that I am a very rustic cook. I rough chop everything. I measure ingredients using my eye only. Basically, I cook like my grandmother and I am so thankful for it. I had the best teachers and I wouldn’t give up that education for anything. 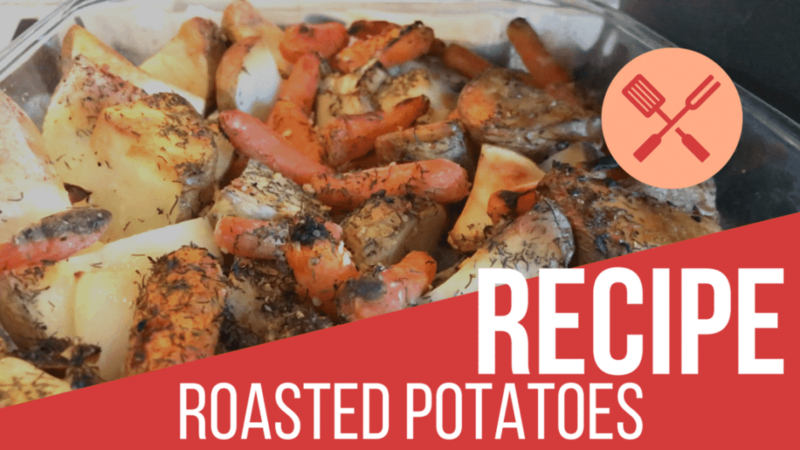 Just in case you wanted to make roasted potatoes and vegetables for your family, I filmed my prep process! Yes, I am in my pajamas. There are all types of stripes happening. I am completely mismatched, but this is real life. I can’t keep pretending that everything looks perfect all day long in my house because it does NOT. This is how I make dinner, people. Take me as I am! As far as the ingredients are concerned — I found this link online. Though this is NOT the exact one that I use. I bought my seasoning package in Astoria in a Greek store. But truly, you can use Oregano, salt, and pepper and basically call it a day. If you have rosemary, you could also use that instead. I mean – whatever you have! “Whatever you have” is my cooking motto. Sometimes, I open up my fridge, see the four fresh ingredients that are left on my shelves, Iron Chef up a meal, and hope for the best. Right? You know what I am saying!